Financially Troubled March of Dimes Will Sell Headquarters, But Will That Help? The March of Dimes has been the source of much commentary over the decades about the institutional will of organizations to survive their own original missions. In light of that, the public announcement of the sale of its headquarters, coupled with its declining finances, will be an interesting next chapter. After running a deficit for the past five years, the 79-year-old March of Dimes has put its national headquarters on the market. Its Form 990 for 2015 lists an operating deficit of almost $27 million on an expense budget of $214 million. It is interesting to note on its 990 returns that the organization consistently outspent what it brought in by millions in each of the past five years. This year, it listed its fund balance as a negative $12 million. This is, of course, one of a number of inflection points for the organization, founded by President Franklin D. Roosevelt in 1938 as the National Foundation for Infantile Paralysis. 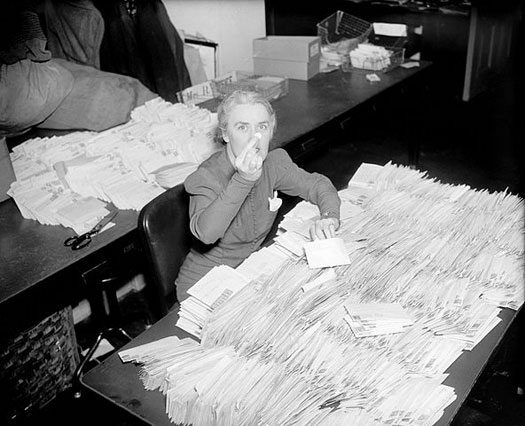 That organization faced questions about its own relevance and considered potentially disbanding altogether after polio was largely eliminated in the 1950s. In the end, it decided to continue with a new name—or a few new names, as William Barrett wrote in Forbes in 2008. After a five-year internal debate that weighed adopting specific causes such as mental illness and arthritis, the charity in 1958 said—at a nationally broadcast press conference, no less—it would embrace a laundry list of medical needs, including birth defects. It also shortened its official name to the more generic National Foundation. Bad moves. The lack of something specific to fight contributed to what by the late 1960s would be a 75 percent decline in real fundraising from that 1954 peak. So O’Connor shifted tactics again in 1965, declaring the National Foundation would dedicate itself simply to fighting birth defects. 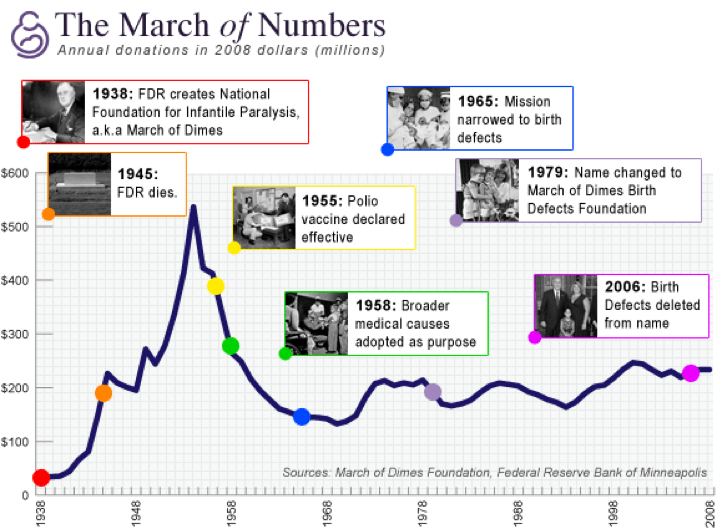 Contributions eventually began rising, so much so that in 1979 the National Foundation changed its official name yet again, adding “birth defects” and, for the first time, “March of Dimes” so it became March of Dimes Birth Defects Foundation. In 2006, reports Barrett, it opted to end its focus on birth defects altogether, but even with all of this effort, the organization never regained the same prominence in the hearts of donors. On that 2016 990, the year’s revenue is listed as $169 million. There’s no question that the building sale may alleviate cash flow problems in the short run, and maybe even a little in the long run by eliminating fixed costs related to the building, but in a situation in which deficits are so consistently tolerated, the problem may lie elsewhere.